A coronary stent is one of several treatment options for congestive heart failure. Congestive heart failure occurs when blood vessels supplying the heart muscle become narrow or blocked. There are several options for congestive heart failure treatment. As a rule, doctors will try the least aggressive treatments first. Coronary bypass graft surgery is the most invasive treatment. In this procedure, the chest is opened and a blood vessel is taken from another part of the body and grafted onto the blocked vessel, bypassing the blocked segment. Coronary angioplasty is a procedure in which a catheter is inserted into the artery. At the end of the catheter there is a small balloon. When the balloon reaches narrowed parts of the artery it is inflated, opening the artery and allowing normal blood flow. If the angioplasty is not sufficient to restore blood flow, a coronary stent may be placed in the artery. 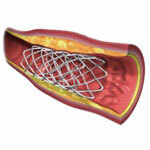 The majority of stents are composed of plastic or metal mesh. The stent is placed in the artery after angioplasty and expands by itself to keep the artery open. Stents in arteries that are largely made of fabric. A coronary stent may be coated with medication that helps prevent the arteries form closing again. Once a coronary stent is put in place it remains there. Coronary stent placement has several benefits. Unlike bypass surgery, placement of a stent is not terribly invasive. There is no lengthy recovery time. Most of the risks associated with surgery are not problematic with stents. Blood flow is restored to the heart muscle, relieving the symptoms and complications of congestive heart failure. Even though stents can relieve congestive heart failure, it is still important to take preventive measures to avoid future blockages. A healthy diet that is low in fat and sodium, high in fiber, and that helps you maintain an ideal weight is essential. A regular exercise regimen is also a significant part of managing this condition. Medications may also be prescribed to address underlying causes of congestive heart failure.